The exciting innovation of image recognition in advertising lets users take pictures of any object with their phones’ camera — say, the label on a bottle of wine or the cover of a book — and find more information about the object by being directed automatically to a related Website. Men’s Health and Rolling Stone were the first print publications to take advantage of this new way of extending the reach of traditional advertising. Image recognition is attractive for publishers because they can offer advertisers a chance to tie together their print and online ad campaigns seamlessly. Advertising based on image recognition faces some initially daunting challenges in the broad mobile market because many cellphone cameras produce blurry, dim images and sending those images can be expensive or complicated. However, the iPhone’s superior camera quality and ease of use make it a natural option for this new way of extending your brand. Amazon: If your product is listed on the Amazon.com site, you’re already recognizable in the Amazon app. Amazon tests its own image recognition engine and claims that even if a user takes a picture of an object that’s not on the site, such as a dog, the app responds by showing ads for related products, such as dog food or flea medication. GetFugu: The mobile start-up company GetFugu recently launched its See It technology, which allows users to point their phone camera at any modern corporate logo or sign, take a picture, and then be directed to that brand’s website. The app also includes voice and GPS search functions. GetFugu claims that its technology has made the logo recognition process almost 90 percent accurate and that it can discern among such similar items as the Apple logo, the AT&T logo, and the Death Star from Star Wars. 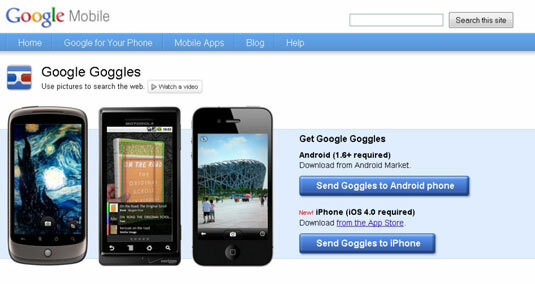 Google Goggles: This app has gotten a lot of press because of its “wow factor.” Using Google Goggles, you can point your phone camera at almost any object and see more information about it. Point the camera at a label on a wine bottle, for example, and you’ll likely be directed to the winery or a wine distributor. Point your phone camera at a building or another landmark and you see information about its architect, the history of its location, or other details. You can even take a picture of someone’s business card and Goggles automatically enters the information into your contact database. This technology seems destined to become increasingly popular for all kinds of uses.